Do you want to learn a secret? Are you nodding your head? I’ll tell you only if you promise not to tell anyone, pinkie swear? Author Marko Kitti of the Jesper Jinx Series and Delbert The Reluctant Spy is back with Jesper Jinx's Best Friend (Volume 6). Eleven-year-old Jesper Jinx of Puffington Hills is known to always be up to no good. Jesper is a mischievous and whimsical character that constantly plays tricks on others. Well, this time the trick is on him. 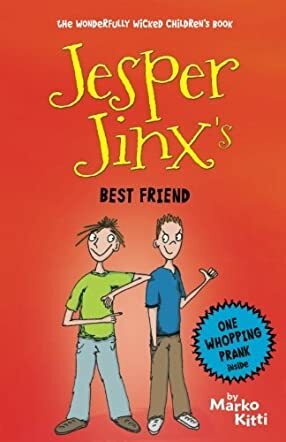 In Jesper Jinx's Best Friend (Volume 6) by Marko Kitti, Jesper discovers that his best friend, Oliver Oliverson, is dating Jesper's sister, Melinda. Yuckkkkkk! How could he? After all, isn't Oliver his best friend, his roadie? Wasn't Oliver always with him when he played tricks on everyone, and now he's spending time with Melinda. Ewwwwww! Jesper feels so betrayed. What's next? Will this relationship between his best friend and his horrible sister go on forever? Jesper has a plan, but will it work or will it backfire this time? I truly enjoy the work of Marko Kitti because he's like a narrator that sets the tone for his stories. He put me in the mental space of Rod Serling, as Serling narrates each story in The Twilight Zone. The narration not only sets a precedence for an adventure, but it creates the backdrop for the ebb and flow of the story. Adding the contract of secrecy is a special touch because children love the elements of secrets and surprises. By signing this contract, children will feel part of something special. If you are looking for an easy to read book that your children will be sure to enjoy, pick up a copy of Jesper Jinx's Best Friend (Volume 6) by Marko Kitti. Warning: giggles may be contagious.